There is a generation of panto stalwarts among the entertainers of this country that is guaranteed to bring in the crowds; big names who attract a lot of business to local theatres and who have been playing the circuit for years and doing it very well, thank you. Unfortunately, they are no longer eligible for the title roles – too old to be a dashing Prince or a pretty Princess, they take on the supporting character roles: the villain’s henchman, the comic turn… And so we get some rather curiously skewed versions of the traditional tales in order to make the most of the star billing. This is reflected in the promotional material. 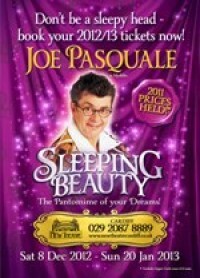 Thus this production of Sleeping Beauty has posters of its star Joe Pasquale, and Joe Pasquale alone. You don’t have to read much further to realise he’s not in the title role. Barney Harwood is “Muddles” the court jester – a character who is really Buttons by another name. He performs exactly the same function as Buttons in Cinderella (some scenes are direct lifts from that show!) – with added emphasis because it’s now the star part. This turned out to be a good thing; you get a lot of Barney Harwood for your money. He has a laidback performance style, which means he can throw away lines, but he is also able to crank up the silliness. Obviously he’s delivering Pasquale lines and mucking around with Pasquale props, but Harwood’s comparative youth and good looks help him to put across the corniest and most puerile of gags. When he bows his head in pathos, broken-hearted over his unrequited love for the Princess, it’s touching (in a panto kind of way). Harwood is also possessed of a very pleasant pop-singing voice but rest assured we are never far away from yet another fart joke. He is supported by the remarkable Ceri Dupree, the most glamorous Dame, as Queen Passionella , whose outfits go for exaggerated Las Vegas showgirl glamour rather than the out-and-out silliness of other dames in other shows. With more ostrich feathers than a David Attenborough series about the Life of Ostriches, and a largely deadpan delivery, this Queen is an imposing figure, dishing out the double entendres for the grown-ups. Her entrance (and I use the term carefully) involves a stirring rendition of “It’s Raining Men” – which brings me to another point I’d like to make about the modern pantomime. Some pantos include original songs. Regardless of the quality of these, I always think this is a mistake. For me a key ingredient of pantomime is the barely-relevant but recognisable popular song. These are as important as the topical jokes and the references to local places. The audience knows where it is with a well-known song. This show opens with not one but two original numbers and so it’s a while before we’re on familiar ground and are invited to take part in the performance. It’s more like watching the opening of a new musical than an icebreaker to kick-start a panto. That said, Lucy Williamson (evil Carabosse) and Shona White (benevolent Enchantress) are in excellent voice in duets that are more like duels – although I think Evil wins out in the costume stakes. Williamson clearly relishes her part and handles hecklers mercilessly. Lucy Evans is a likeable Princess Beauty, upstaged by her very handsome Prince (Alexis Gerred) who sends up the dashing hero, with cape-swishing and thigh-slapping a-plenty. He and Harwood share some hilarious moments involving powdered custard. I also enjoyed Michael Peluso as Carabosse’s hunchbacked son and henchman. He was underused, I thought. There is not one but two 3D sequences, with insects and spiders launching themselves into the screaming faces of the audience. Good fun but I was disappointed by the moment the Prince awakens Beauty with a kiss. Director Jonny Bowles could have made more of that pivotal scene. In this one, she sits up straight away and that’s that. The show is ultimately Harwood’s. His boyish energy and cheeky charm win everyone over. Considering he had something like four days to learn the part, he muddles through excellently. I made the right choice.